TORONTO (June 24) — Obviously, I cannot say for certain. 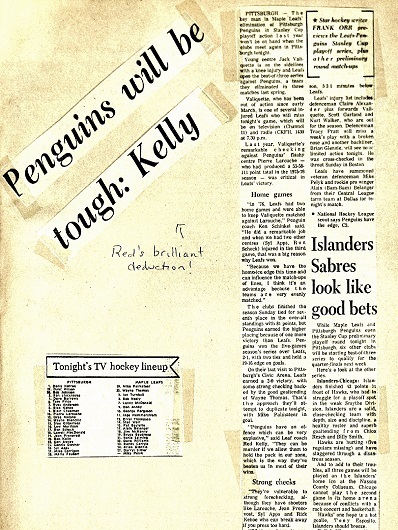 Neither can most others, as Lou Lamoriello never divulges company secrets. 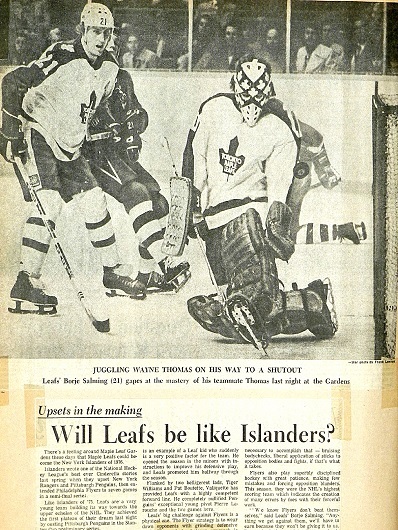 But, I would be shocked beyond measure if the general manager of the Toronto Maple Leafs even considered trading his first–round pick Friday night for New York Islanders defenseman Travis Hamonic. 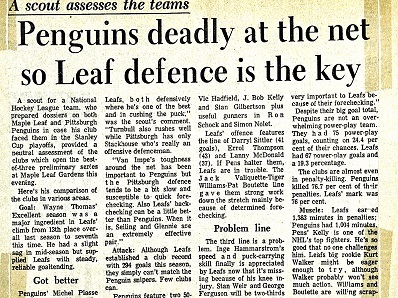 Such conjecture developed a life of its own in the hours before the National Hockey League draft in Chicago. 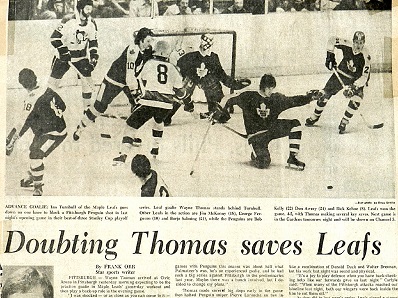 Yet, there was Lou, leading the Toronto contingent to the podium at the United Center just before 9 p.m. Eastern, fully invested in Swedish blue–liner Tim Liljegren. As he darn well should have been. 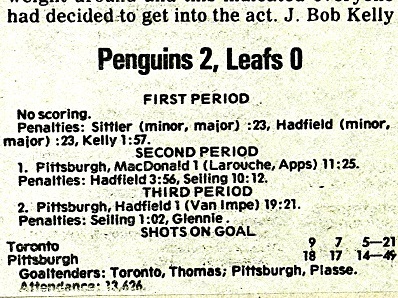 How many times have the Leafs committed the heinous error of off–loading their first–round choice for a quick fix? I’ll tell you how many: 11. In 1971–76–78–80–91–96–97–2003–04–07 and 2010. Where has it gotten the club? 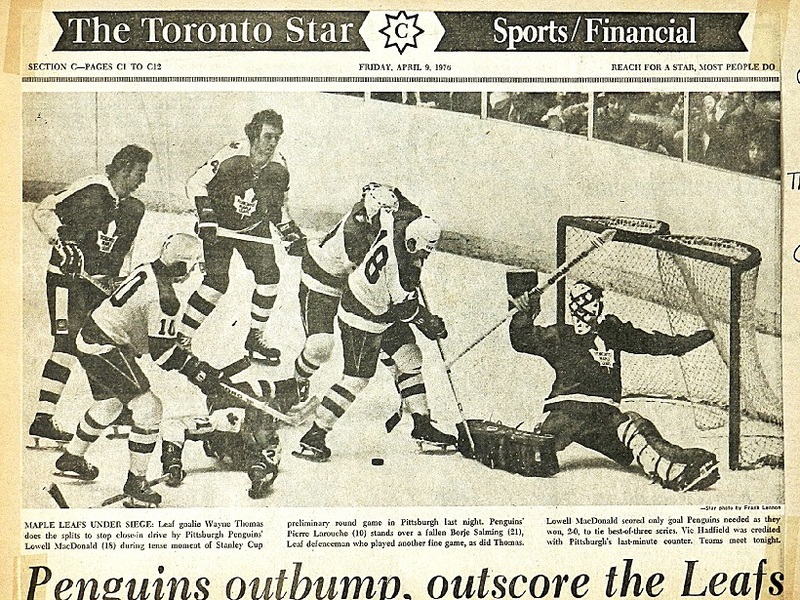 I’ll answer that, too: Only five teams in the post–1967 NHL have not appeared in the Stanley Cup final — both versions of the Winnipeg Jets; Columbus; the Minnesota Wild and… the Leafs. 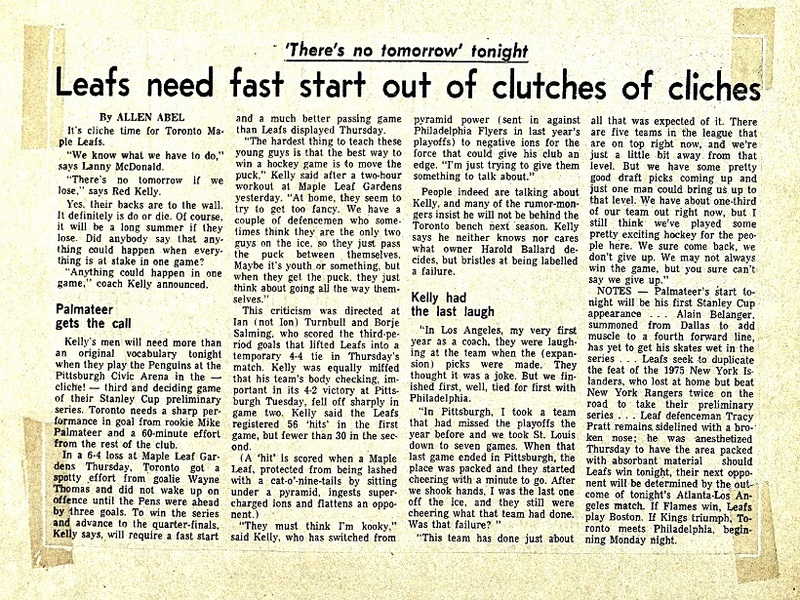 There are myriad reasons for Toronto’s 50–year absence, but frittering away opening–round draft choices is near the very top. 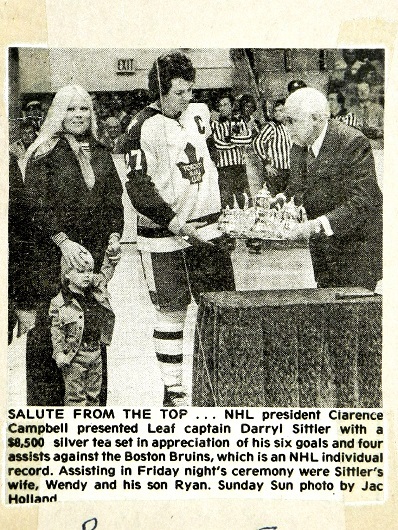 Why, then, would Lamoriello jettison this year’s pick for a player that is arguably no better than the top three defenseman already with the hockey club: Morgan Rielly, Jake Gardiner and Nikita Zaitsev? 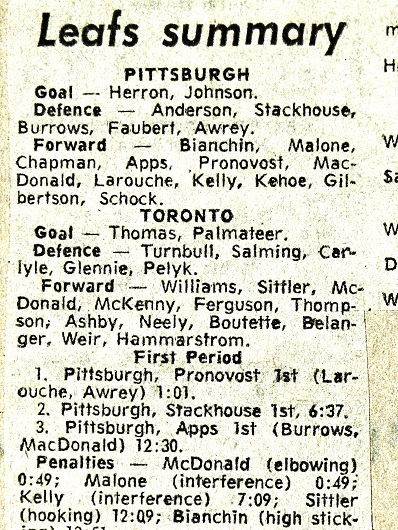 Sure, Hamonic would be a useful addition. But, for nothing higher than a second or third–round pick. 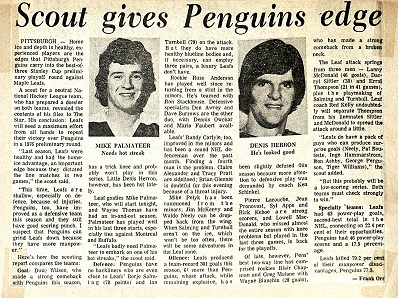 Garth Snow asking for two first–rounders is enough to make any rival GM gag. Then barf. 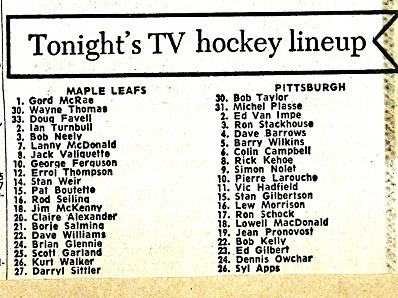 Most “available” players are never the equal of a first–round pick… as the Leafs have discovered time after time. And, to their interminable dismay. SATURDAY NOTE: The Calgary Flames have traded a first and two second–round picks to the Islanders for Hamonic. 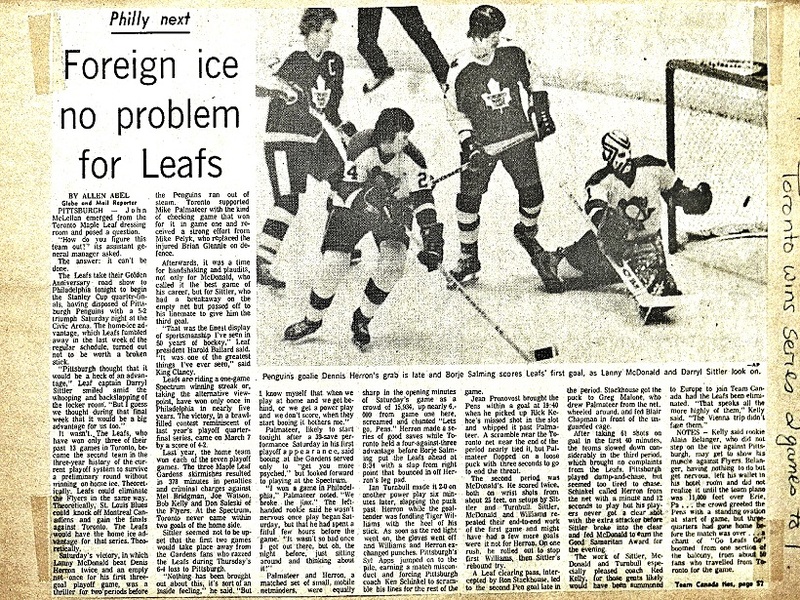 Here’s another reason why the Leafs should refuse to deal a first–round choice: Mark Hunter. There was limited hockey acumen required to draft William Nylander, Mitch Marner and Auston Matthews in the past three years. Any chimpanzee could have made those picks. 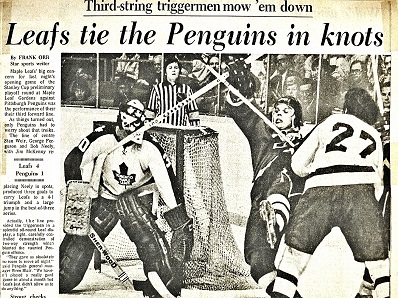 Now, with the Leafs having “graduated” to the middle of the opening round — with plans to bury themselves deeper — Hunter will finally begin to earn his stripes as, reputably, one of the top bird–dogs in the game. Why bring him aboard with such crucial responsibility if you’re going to trade the more challenging picks? It makes no sense whatsoever. 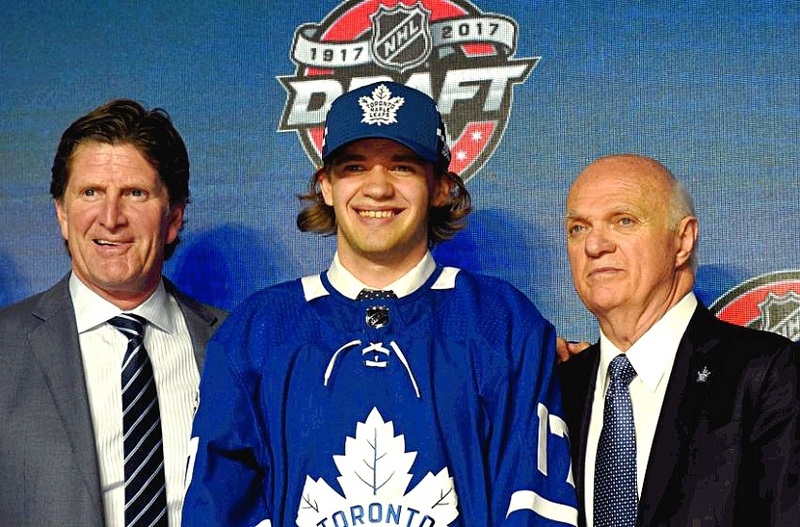 We likely won’t know for several years whether Tim Liljegren can play in the NHL. 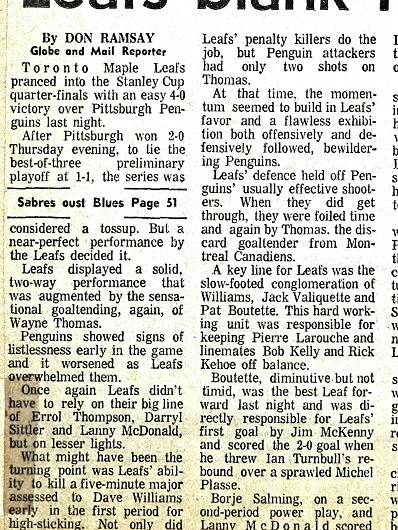 But, it’s Hunter’s chore to provide the Leafs with a surprise or two along the way. You become a truly great scout not by picking in the top five. As mentioned, just about anyone can do that without screwing up (though, it does occasionally happen). Ultimately, and fairly, Hunter will be assessed by virtue of his later first–round selections — Liljegren included — and those unearthed deeper in the annual seven–round lottery. Another word of caution: Many Leaf fans in communication with me on Friday said, “Ah, how important is a first–rounder given where the team will be drafting in the next few years — 20th or lower? May as well trade the pick for an established player.” Let’s not get too far ahead of ourselves. At the moment, the Leafs don’t even have an established No. 2 goalie. 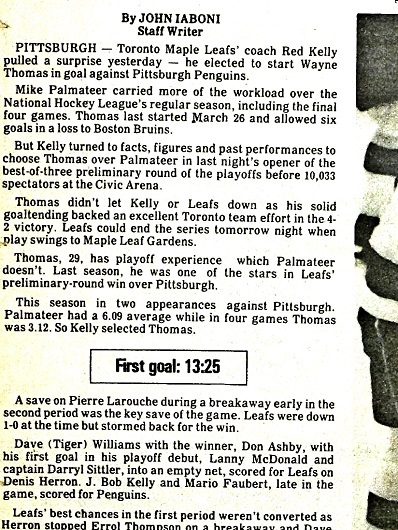 And, the bargain–basement approach from last season didn’t work. Even with a half–decent stand–in, the club is one long–term injury (to Frederik Andersen) removed from re–joining the draft lottery. Perhaps the elite portion of the lottery. You wouldn’t want your favorite team to be caught handing a No. 5 or 6 choice to the opposition. It’s already happened far–too many times — with similar “guarantees” of rapid, sustained improvement. The lone, sure–fire way of avoiding such an embarrassment? Hang on to your opening–round pick. 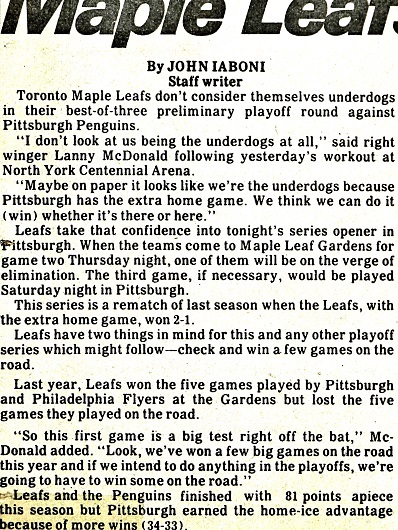 As did Lamoriello, prudently, on Friday in Chicago. 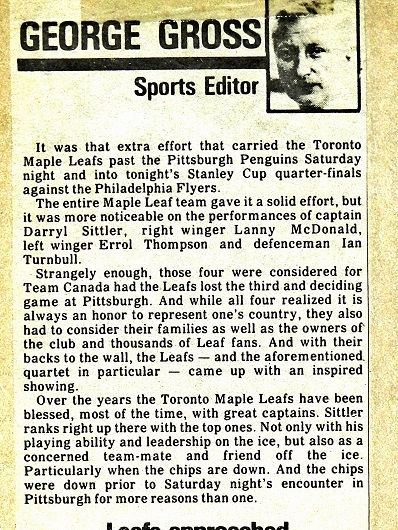 If the Leafs are going to trade a first–rounder, it had better come with an iron–clad guarantee on the other end. 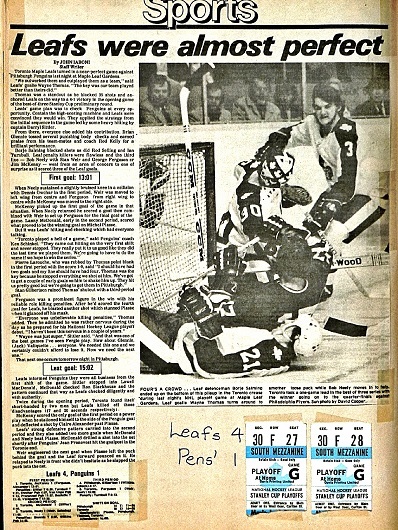 A Drew Doughty–type guarantee (as I’ve postulated). Otherwise, what’s the rush? If a legit No. 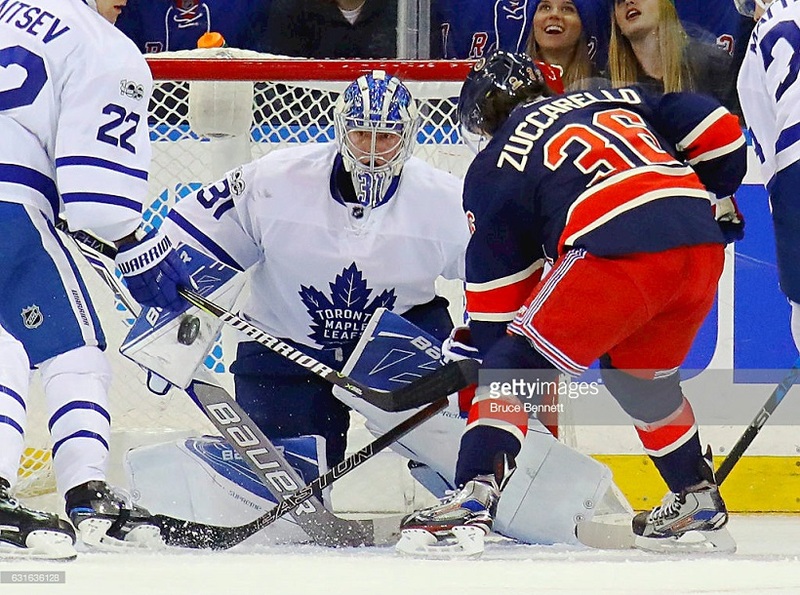 1 blue–liner materializes three years down the road, Auston Matthews will still be 22. You most certainly do not trade a first–round pick for Travis Hamonic. In any year. And under any reasonable circumstance. SHAKIN’ MY HEAD: We’ll see how things work out but I cannot believe, for the life of me, that Chicago traded Artemi Panarin on Friday. There may be a half–dozen players in the NHL with as much raw talent as last year’s Calder Trophy winner. Perhaps not even a half–dozen. I suppose the Hawks can rationalize that they got annihilated by Nashville in the playoffs this spring with Panarin, and won two Stanley Cups with Brandon Saad. And, Panarin may not have been easy to sign a couple years down the road. But, honestly, how to do give up such a dynamic scorer? 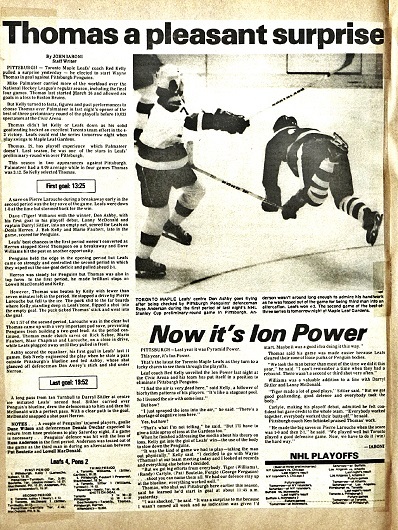 Particularly in today’s locked down NHL? 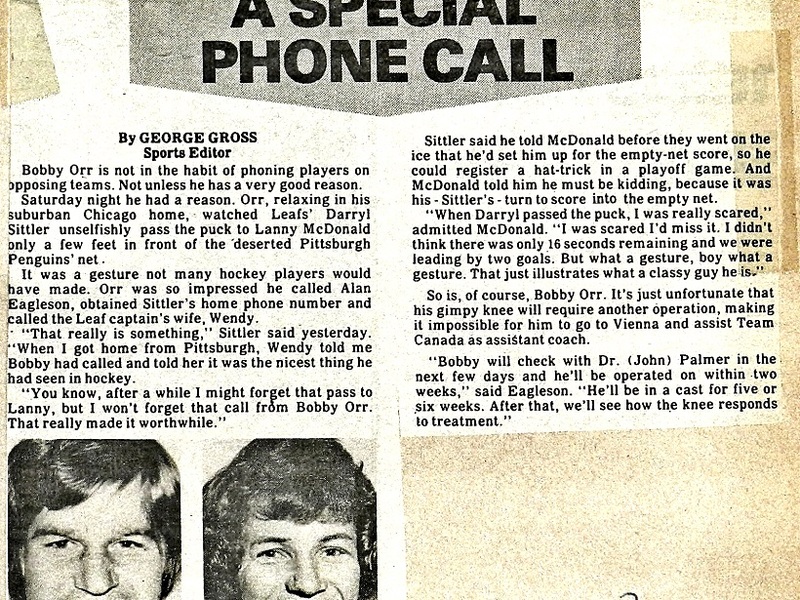 It sounds a bit as if the inmates are running the asylum on West Madison St. And, that normally doesn’t turn out well in professional sport. The Blackhawks have been an exemplary franchise since 2009 — Stan Bowman routinely unearthing players to fill for those discarded in the cap–crunch. But, he’ll have to search far and wide to replace Panarin. 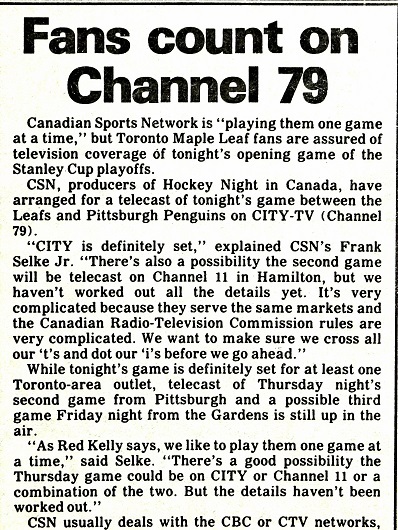 Between 1975 and 1981, the Stanley Cup playoffs featured a so–called “preliminary” round. 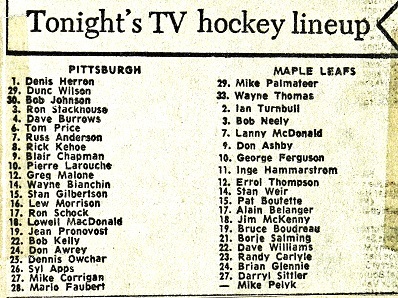 For five seasons (1974–75 to 1978–79), this round was a best–of–three series. With 18 clubs and four divisions, 12 qualified for the Cup tournament. 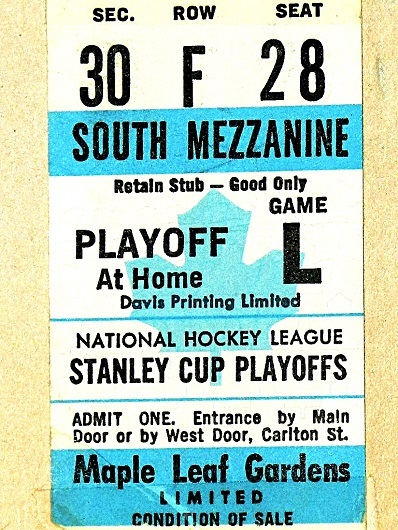 The division winners received an automatic bye into the quarterfinals. The next eight teams were then aligned according to regular–season points. 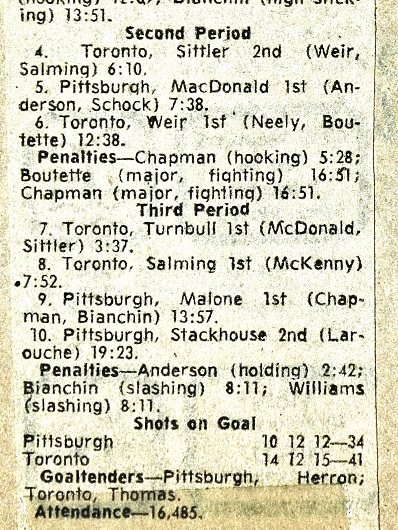 In the best–of–three preliminary round, the match–ups were 1 vs. 8, 2 vs. 7, 3 vs. 6 and 4 vs. 5 — the higher–ranked club having Games 1 and (potentially) 3 at home. 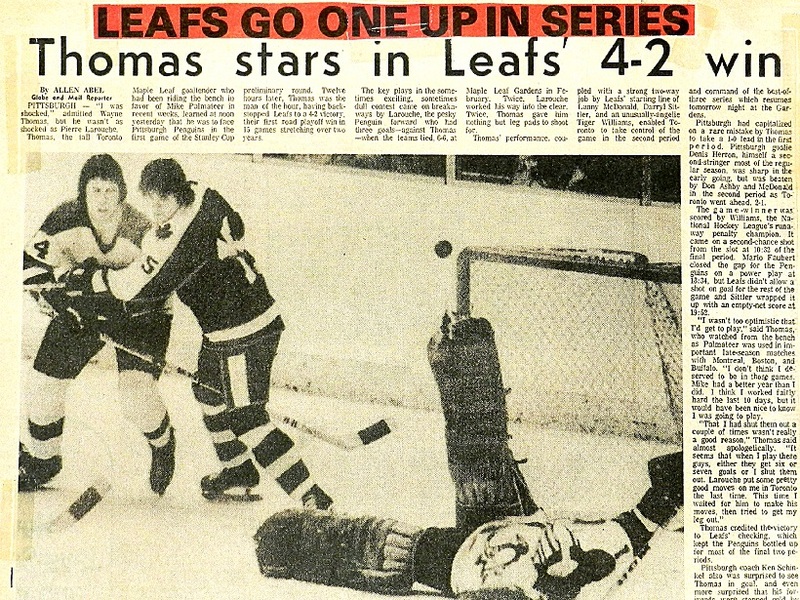 In this format, the Toronto Maple Leafs were a perfect 5–for–5. 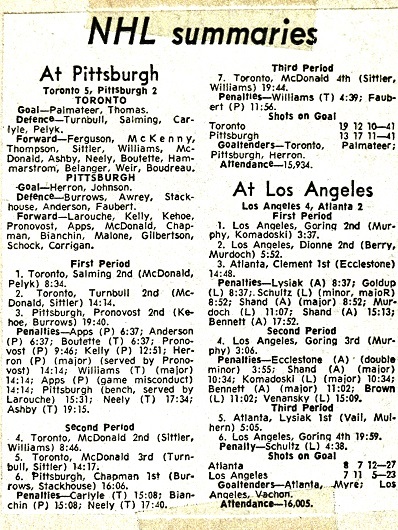 A three–game triumph over Los Angeles in 1975 was the first series win for the club since the 1967 Cup final. 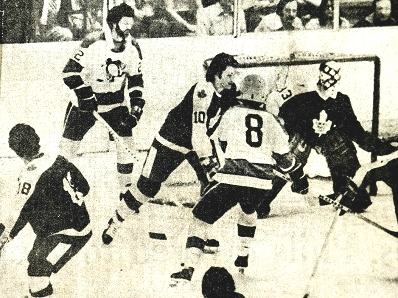 Toronto swept the Kings (in 1978) and Atlanta Flames (1979) in the best–of–three series. 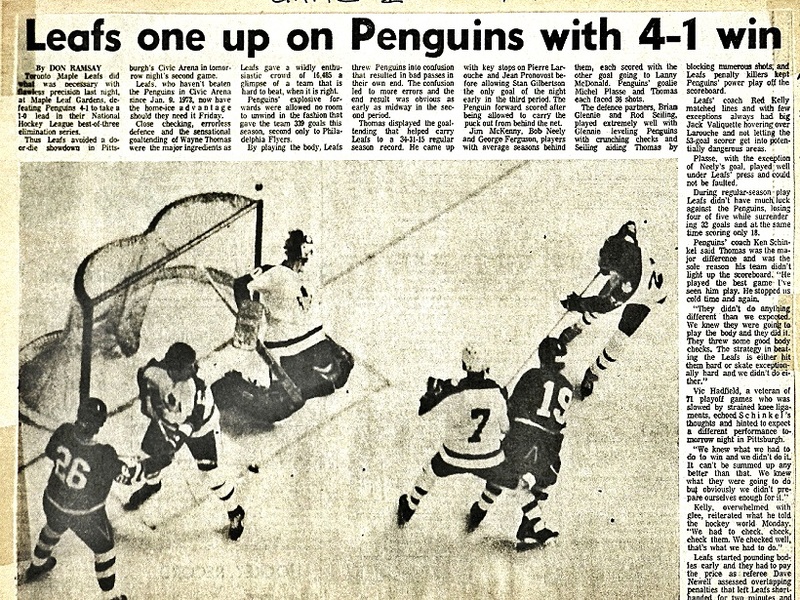 In 1976 and 1977, Leafs opened against the Pittsburgh Penguins. 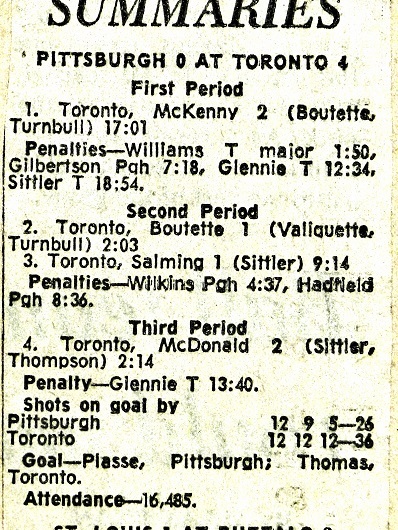 Toronto twice prevailed in three, winning Games 1 and 3 while dropping the middle match. 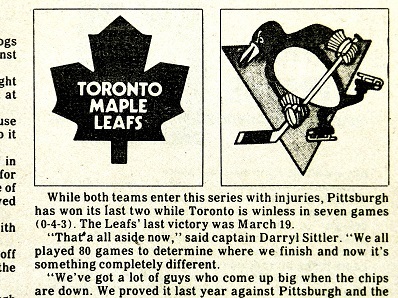 In ’76, the Leafs won both games at home; in ’77, both games in Pittsburgh. 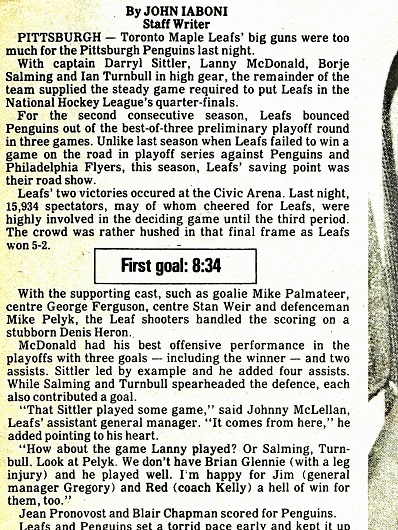 These were the good Leaf clubs that featured Hall–of–Famers Darryl Sittler, Lanny McDonald and Borje Salming. 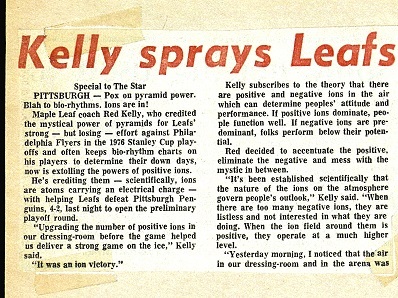 Coached by Red Kelly, then Roger Neilson. 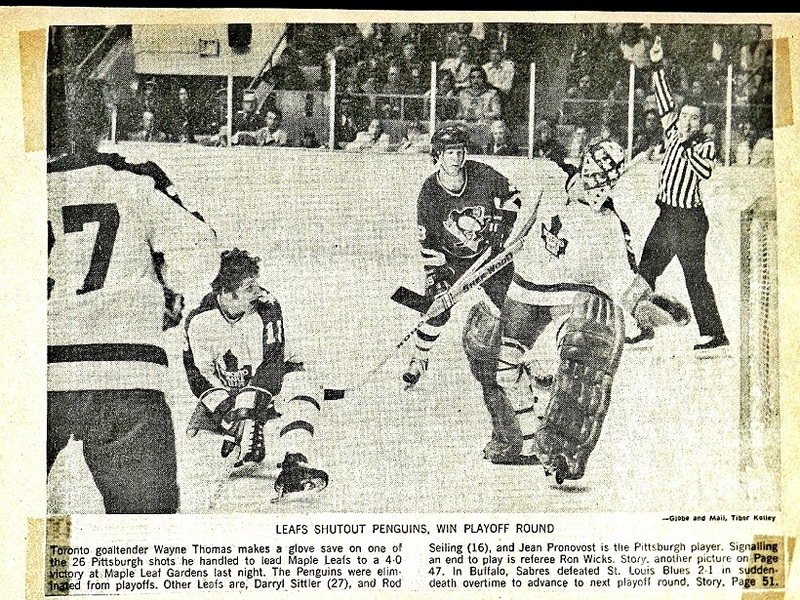 Backstopped in goal by Wayne Thomas, then Mike Palmateer. Ably supported by such players as Ian Turnbull, Dave (Tiger) Williams, Stan Weir and Pat Boutette. 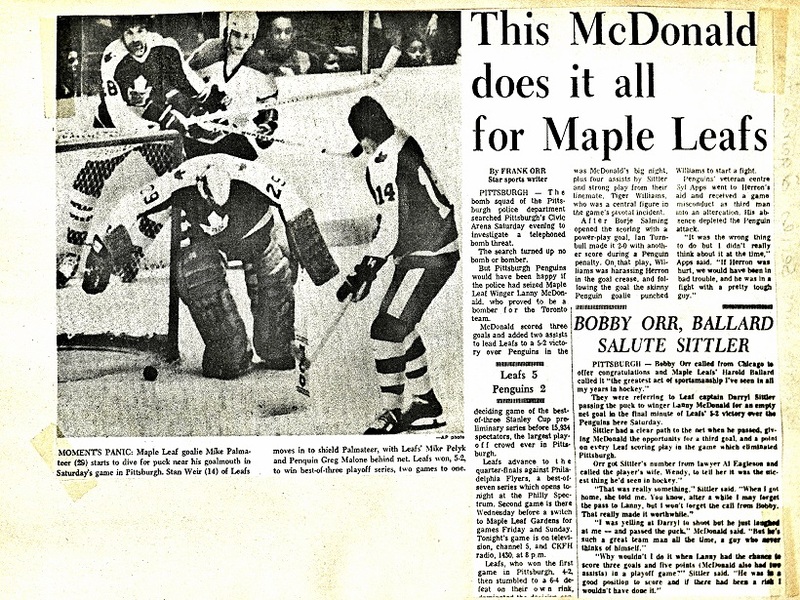 Only once, however, did the Leafs advance beyond the Stanley Cup quarterfinals (or second round) — in 1978, when McDonald’s overtime marker in Game 7 at the Nassau Coliseum upset the New York Islanders. 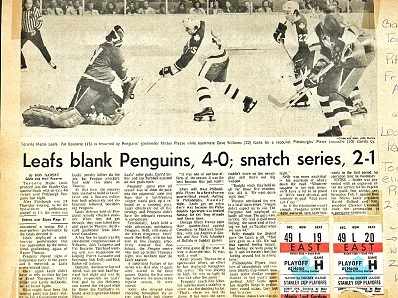 No team could beat the Montreal Canadiens of that era; the Habs of Scotty Bowman, Guy Lafleur, Ken Dryden, Larry Robinson et al winning four consecutive Stanley Cup titles, beginning in 1976. 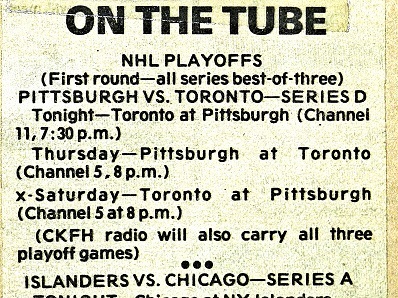 HARD TO BELIEVE, IN THIS ERA, THAT LEAF PLAYOFF GAMES IN THE MID–70’s WEREN’T GUARANTEED TO BE SHOWN ON LOCAL TV UNTIL THE LAST MINUTE — AS PER THE ABOVE STORY. 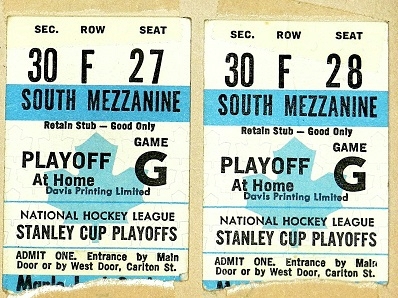 THESE WERE THE SEASON TICKETS MY DAD PURCHASED IN THE SUMMER OF 1975 — LAST ROW OF THE SOUTH MEZZANINE (OR UPPER–BALCONY) IN MAPLE LEAF GARDENS, BEHIND AND TO THE LEFT OF THE GOAL THE LEAFS DEFENDED IN THE FIRST AND THIRD PERIODS. 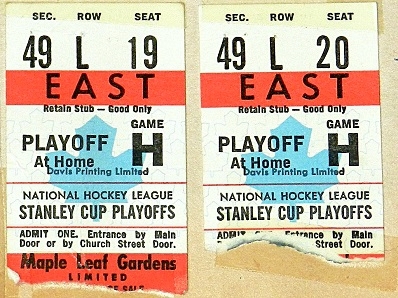 WE WERE FORTUNATE TO OBTAIN THEM, AS ONLY SINGLE TICKETS IN THE CORNER GREY’S (TOP LEVEL OF SEATS) WERE ALSO AVAILABLE. 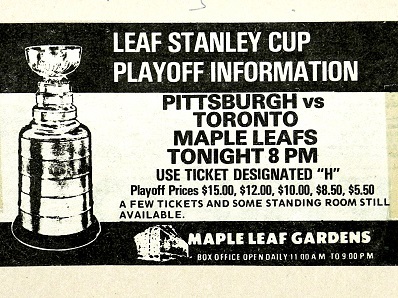 IN 1975–76, THESE COST $6.60 PER GAME, OR $277.20 (x2 = $554.40) FOR THE ENTIRE SEASON. 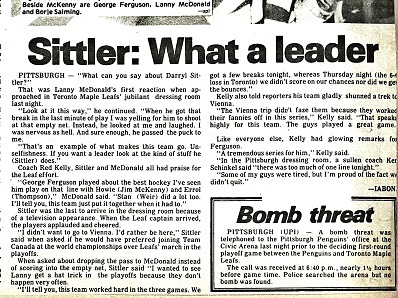 AMONG THE MOST MEMORABLE PLAYOFF GAMES I ATTENDED IN THE SITTLER–McDONALD ERA. WENT WITH MY DAD IN RED SEATS THAT HIS ACCOUNTING FIRM HAD ACCESS TO. 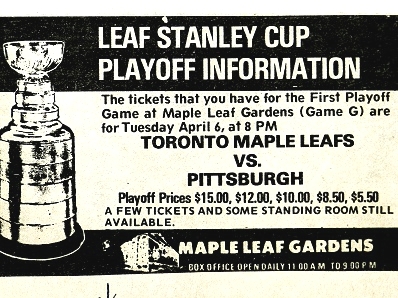 ROUGHLY HALFWAY UP IN THE EAST STANDS, BETWEEN CENTER–ICE AND THE SOUTH BLUE–LINE. GREAT LOCATION. 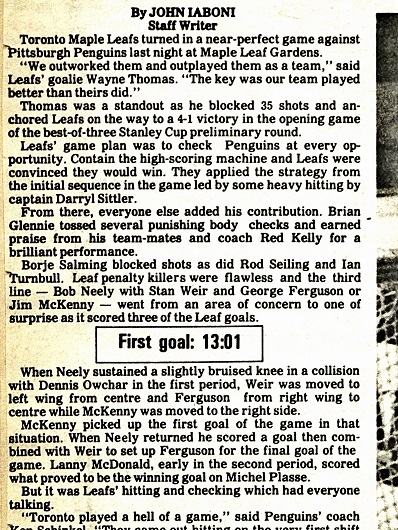 LEAFS KILLED OFF AN EARLY HIGH–TICKING MAJOR ASSESSED TO TIGER WILLIAMS BY REFEREE RON WICKS. 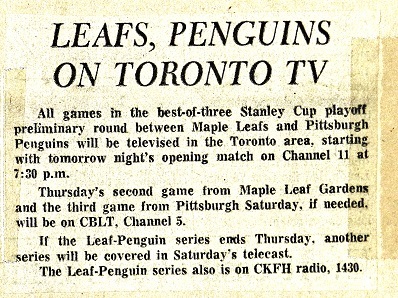 AND, IT WAS ALL TORONTO FROM THAT POINT ON. 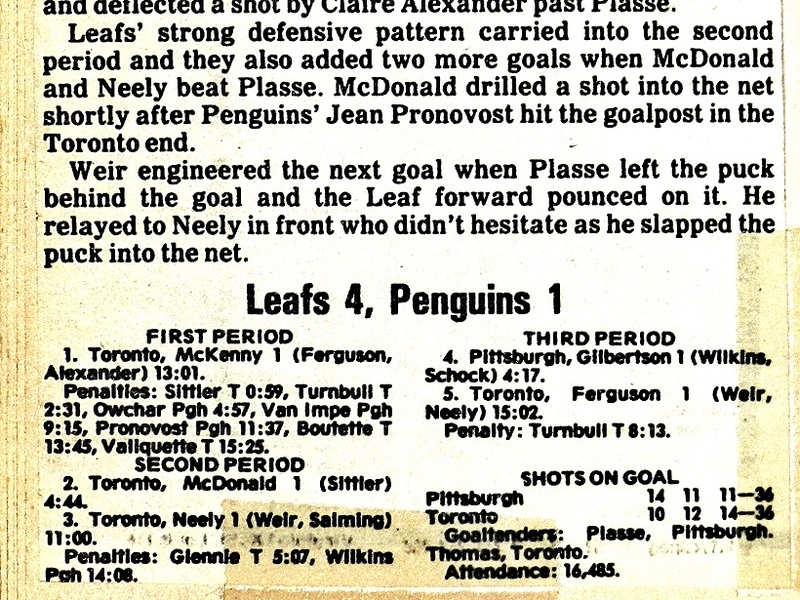 JIM McKENNY’S GOAL, LATE IN THE FIRST PERIOD, STOOD AS THE GAME AND SERIES WINNER. 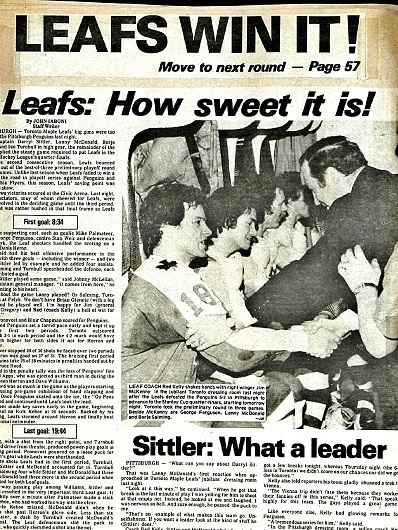 IT WAS TORONTO’S SECOND PLAYOFF VICTORY SINCE 1967. 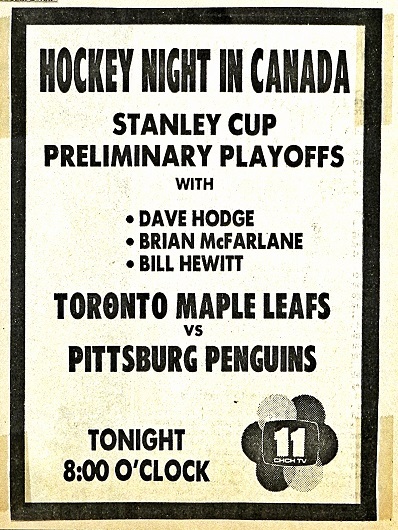 GAME 2: PITTSBURGH AT TORONTO — APR. 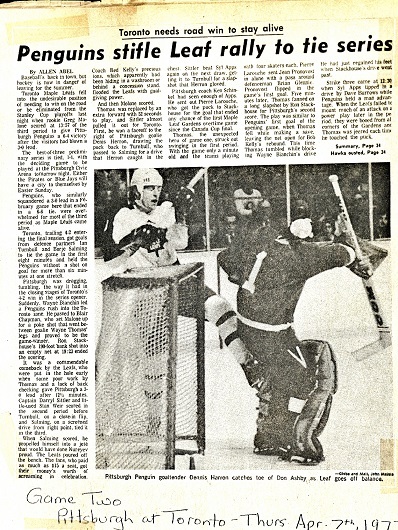 7, 1977. 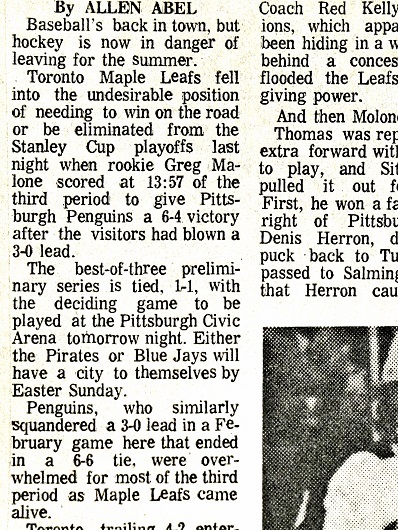 TORONTO BASEBALL FANS WILL RECOGNIZE THE DATE OF THE LEAFS ’77 HOME PLAYOFF MATCH AGAINST PITTSBURGH. 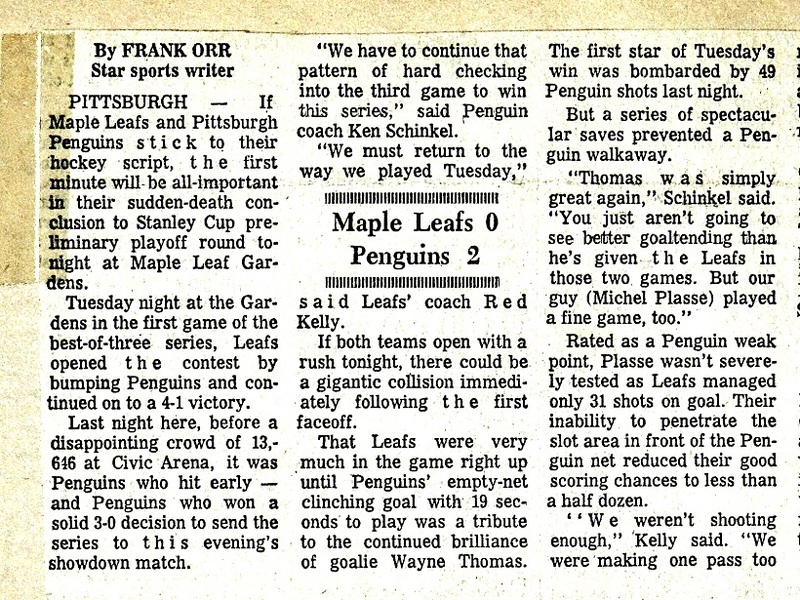 EARLIER IN THE DAY, THE TORONTO BLUE JAYS HAD PLAYED THEIR FIRST–EVER GAME, DEFEATING THE CHICAGO WHITE SOX, 9–5, AT SNOWY EXHIBITION STADIUM. I WITHSTOOD THE FREEZING TEMPERATURE AT THE BALL GAME FOR FIVE INNINGS BEFORE COMING HOME TO THAW OUT. 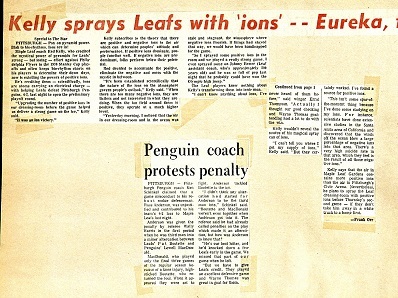 I THEN WENT DOWN TO MAPLE LEAF GARDENS. 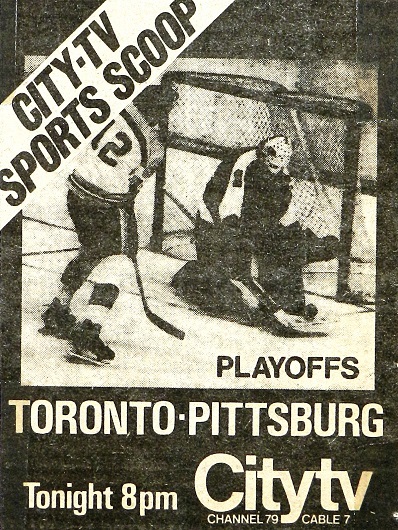 PITTSBURGH TOOK CONTROL WITH A 3–0 LEAD IN THE OPENING PERIOD AND HELD OFF A FURIOUS LEAF COMEBACK TO TIE THE SERIES. 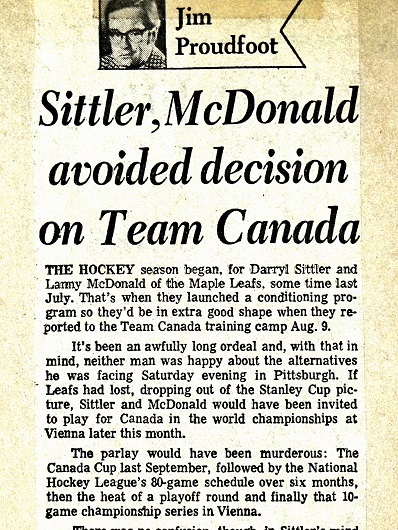 THIS WAS AMONG THE DEFINING HOURS OF THE SITTLER–McDONALD TANDEM — AS PROLIFIC AS ANY CENTER–RIGHT WING COMBO IN FRANCHISE HISTORY. 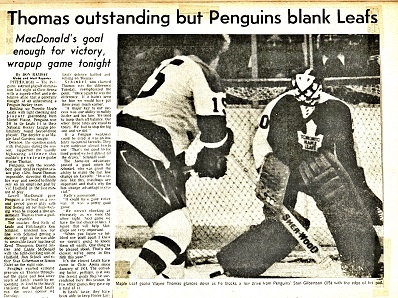 THE DUO ERUPTED FOR THREE GOALS AND SIX ASSISTS IN A THOROUGH BEAT–DOWN OF THE PENGUINS AT CIVIC ARENA. 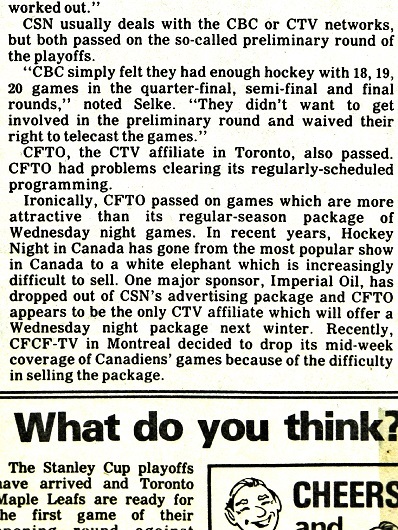 ON A SATURDAY NIGHT, TELEVISED ACROSS CANADA BY CBC. 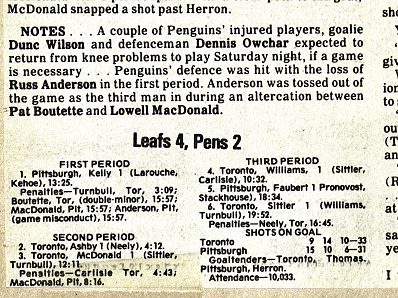 SITTLER HAD A BREAKAWAY ON AN EMPTY NET IN THE FINAL MINUTE. 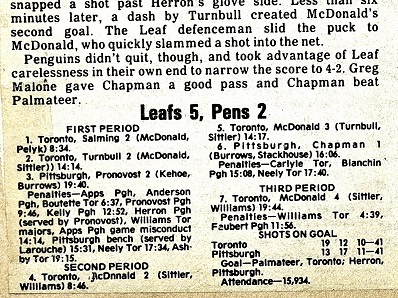 INSTEAD OF SCORING, HE WAITED AND FED McDONALD FOR THE HATTRICK. 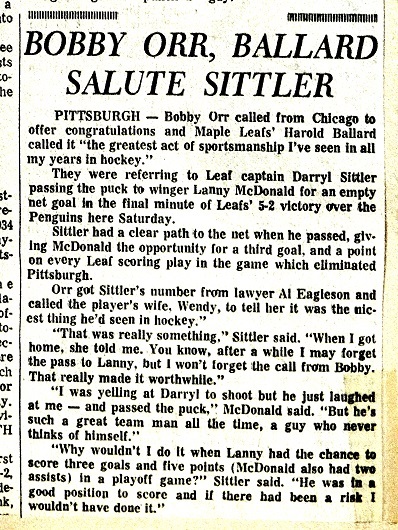 IT SPAWNED PRAISE FROM LEAFS OWNER HAROLD BALLARD AND THEN–CHICAGO DEFENSEMAN BOBBY ORR.